LET’S TALK ABOUT SOMETHING POSITIVE AS WELL, SHALL WE? Two weeks, ago, the boys got all excited when Luscious and I were talking about putting in a vegetable garden, so I bought some seeding potatoes and dredged my memory for an article I’d read in Better Homes & Gardens a few years back. 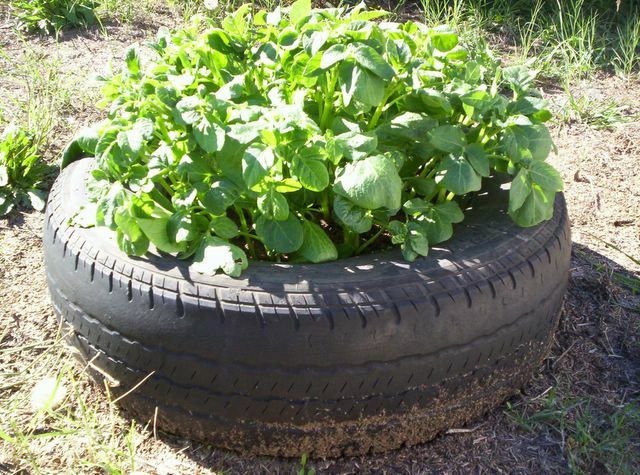 There’s a way of growing them using four car tyres, and by strange coincidence we have four sitting behind the shed. So we got out the back and planted our crop: the boys in a state of excitement, me in a state of Ah well, if my memory’s rubbish at least we had a bonding moment and had some fun together. A Battersby growing things. What next?